Compliance is a vitally important area for companies engaged in importing or exporting. But a field so complicated can quickly become overwhelming. Some companies may not even know where to begin or how to improve their compliance practices. Jane Sorensen, VP of Operations and Compliance at RAM International is an executive with more than 30 years of experience in the compliance field. In this episode, Jane explains how companies should begin with a Compliance Assessment and fleshes out best practices that can be incorporated in their compliance program. Listeners can utilize this PowerPoint presentation to follow along with Jane’s talking points. What if you had an idea that was so revolutionary that it promised to erupt – as opposed to disrupt – an entirely new market? As an entrepreneur, how would you face the obstacles and trials that come with bringing this idea from concept to execution? 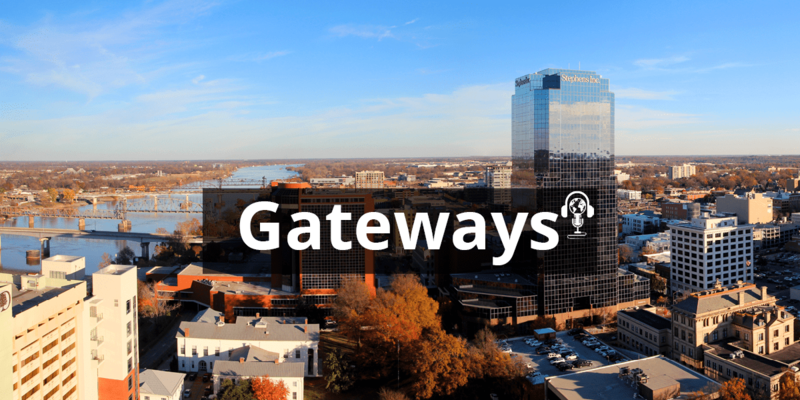 In this episode of the Gateways podcast we sit down with Layne Fortenberry, the chairman and co-founder of Grainster, a tech start-up from Little Rock and the 2017 winners of the Talent Unleashed Awards for Best Idea. Grainster’s technology provides a digital trading platform for farmers and buyers. Their technology enhances global food security and small farm strength by freeing growers to offer their production directly to a global buying audience. Layne shares with us what it has been like to overcome obstacles common to entrepreneurs (including funding) and the tools and strategies he has used to unleash the power of a great idea. SMEs with valuable products will often just export reactively – meaning they export only when an overseas buyer presents themself. Reactive exporters often lack a plan or strategy for tapping into overseas markets and will usually encounter legal, logistical and technical obstacles that make exporting difficult. Many of the today’s fastest growing economies are in Africa. Salim Amin, one the of continent’s foremost journalists, joins us to discuss Africa’s groundbreaking technologies and the economic shifts taking place across the continent that are elevating the standard of living. We discuss what countries are doing to create a positive business climate, the way this positive climate manifests itself and places of opportunity for companies with the right mindset. We end our conversation by discussing the work and legacy of his father, Mohamed Amin, whose coverage of critical events in Africa made him one the most renowned photojournalists in the 20th Century. Stu Todd joins us to conclude his series on principals of leadership and shared values by giving us his story of serving under General Norman Schwarzkopf. He also provides unorthodox sources of learning and leadership apart from books and biographies from which business leaders can learn principals of success. A key part of the World Trade Center Arkansas’s mission is to provide students an enhanced educational experience in global commerce. Jamie Allen of Little Rock has served as the World Trade Center Arkansas’s intern since 2016. Having graduated this month, she sits down with us on her last day as an intern to share her experiences interning at the World Trade Center before serving in the Peace Corps later this year. Episode 11 – The 9 Legal Secrets Every Entrepreneur Should Know For A More Bodacious Business. In Episode 11 of the Gateways Podcast, Angela Grayson of Precipice IP shares her expertise in Intellectual Property for business owners. In this session, Angela gives a special rendition of her original presentation The 9 Legal Secrets Every Entrepreneur Should Know For a More Bodacious Business. Gateways listeners can learn about the legal tools needed to launch a technology-focused business and how to use Intellectual Property to get a leg-up on the competition. We sit down with Toyin Umesiri, CEO of Nazaru and the convener of the Trade With Africa Business Summit 2018 and Denise Thomas, director of Africa and Middle East Trade for the World Trade Center Arkansas to discuss commercial and trade opportunities in Africa. Toyin believes that Africa is the next frontier for economic growth and has dedicated her career to connecting U.S. and African businesses to meet the growing needs of the African market. Listen to her discuss what opportunities exist for Arkansas businesses on the continent and how she hopes to bring Africa’s challenges and opportunities to light at the Trade With Africa Business Summit 2018 in Bentonville, Ark. from May 10-11. We sit down with Fernando Marti, the trade and investment commissioner of ProMexico and Melvin Torres, director of Western Hemisphere Trade for the World Trade Center Arkansas to discuss the bilateral trade relationship between Arkansas and Mexico and business opportunities for Arkansas companies. Commissioner Marti comes to Arkansas seeking to strengthen the relationship between the state and Mexico, working with Melvin to find business opportunities for Arkansas and Mexico companies. We sit down with Helen Maringer, CEO of Shire Post Mint, a family-operated small business in Springdale, Ark that crafts officially licensed coins from fantasy titles like Lord of the Rings and Game of Thrones. Helen tells us the story of Shire Post Mint’s beginnings and then shares her experience travelling to Germany and Spain on a trade mission with the World Trade Center Arkansas at 17-minutes into the podcast. We sit down with Geert C. Visser, the Honorary Consul of the Republic of Belarus in Texas, Arkansas, Louisiana and Oklahoma to discuss his role as honorary consul. We also discuss issues of doing business with Belarus, the high quality of Belarus products and the future of the Arkansas-Belarus relationship. We had the opportunity to sit down with His Excellency, Robinson Njeru Githae, Ambassador of Kenya to the United States to discuss rice farming, Kenya’s economy, Regional Integration, Kenya’s Vision 2030, and growing the relationship between Arkansas and Kenya. Ambassador Githae came to the World Trade Center Arkansas during the week of our 10 Year Anniversary to meet with Arkansas companies and agriculture leaders to utilize their expertise in improving the lives of Kenyan farmers. “Having been blessed with a veritable cascade of outstanding managers, leaders, mentors, in my career, one standout was Captain Bo Cox,” says Stu Todd. Stu shares his story of serving in the Army as a young officer under Captain Carlisle B. Cox III, his first company commander in the 24th Infantry Division. Bo was a third generation armor officer who left a profound impact on Stu’s life. Delon Chan, the consul and trade commissioner for the Consulate General of Canada in Dallas offers insight and helpful resources on how to do business with Canada. Delon discusses opportunities in Canada as well as its economy and the sectors in which the country excels as a global leader. Click here to view the accompanying presentation deck with in-depth information and details. Stu Todd shares the stories of individuals throughout his life that have demonstrated an impactful model of leadership. Stu is the principal of CPM, Inc. and has 30 years of experience in retail marketing, licensing, and CPG sales. He has more than 15 years of experience leading cross-functional teams at Sam’s Club and Walmart and served as an officer under General Norman Schwarzkopf in the 24th Infantry Division in the U.S. Army. Episode 1 – Overcoming Customs Issues with Exec. Asst. Commissioner Brenda Smith. Executive Assistant Commissioner Brenda Smith of the Office of Trade for U.S. Customs and Border Protection comes to the World Trade Center Arkansas to host a round table with Arkansas companies. We sit down with Commissioner Smith as she discusses customs issues, the Organization of Women in International Trade and how the Office of Trade ensures that American companies remain competitive in the global market. Gateways is recorded in the University of Arkansas Global Campus podcast studio. To learn more about Coffee Break, the official podcast of the University of Arkansas Global Campus, visit the Global Campus website.